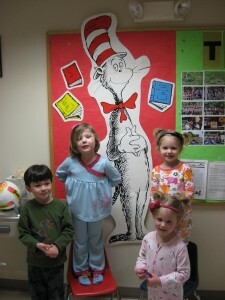 Director's Blog : Happy Birthday Dr. Seuss! Happy Birthday Dr. Seuss! Celebrating Dr. Seuss’ birthday brings back childhood memories of the Cat in the Hat and Green Eggs and Ham. For many of us, our first introduction to literature was through the wonderful world of Dr. Seuss. The importance of reading to preschoolers is well documented. Studies have proven that children exposed to reading are more likely to do well in all areas of education. By listening to an adult read, the child is reinforcing basic sounds that form language. Children who are read to are more likely to express themselves at a younger age. At BUMNS, reading to the children is an integral part of our curriculum. Books are read to the children and discussed. Often a literature based art project grows from a book’s theme, for example; Elmer the Elephant, Rainbow Fish and Good Night Moon are a few examples of literature related art projects created by the children. March winds are gently blowing as we say goodbye to February. This past week was busy with celebrations. On Tuesday, the 5 Day classes celebrated their 100th Day of school with a pizza party. The children counted 100 objects, jumped 100 times, were quiet and froze for 100 seconds and read 100 stories. The 3 and 5 Day children wore pajamas to school on Wednesday in celebration of pajama day. The Easttown Library visited and read sleepy bedtime stories. Muffins, hot chocolate with mini marshmallows were enjoyed by all. The 2 Day children wore their pajamas to school on Thursday. Chapel was held for the 5 Day children on Thursday. Conferences are scheduled for Thursday, March 14th and Friday, March 15th. Parent-teacher conferences provide a means for communication between parents and teachers. Your child’s social/emotional, physical, intellectual and language development has been evaluated by their teacher. The conference is designed to give you an insight into your child’s preschool progress. Sitting will be provided for children enrolled in BUMNS. Before or after conferences, browse BUMNS Mini Boutique. The boutique features Stella and Dot Jewelry, Thirty-one Bags, Flipponz, Vanity Cases, Three Sisterz Dresses, Green Apple (handmade belts, headbands) and Ann’s Toffee. Vendors at the Boutique donate a portion of their earnings to BUMNS.